Today, at long last, Jesus wraps up his “bread of life” speech in the Gospel of John. For 5 weeks, we’ve been working through John chapter 6 where Jesus describes who he is as God, “I am,” through the extended metaphor bread. Today, finally, Jesus wraps up his teaching and, as we hear, the chapter ends by describing the wide variety of responses to all that Jesus has said and done to date. First comes the observation: “This teaching is difficult; who can accept it?” We don’t need to worry about trying to figure out what it is, in particular, what line or concept or command, that the disciples find difficult. All of it is difficult. The whole speech is difficult. All that Jesus is and does and preaches is difficult. The scandal of Jesus in the Gospel of John begins in the beginning, when the word became flesh and lived among us. This teaching is difficult. When we experience Jesus and Jesus’ teaching as difficult, we can take comfort that we are in good company, for even Jesus’ earliest disciples had a hard time with it. If we don’t think it’s difficult, maybe we have misunderstood. “This teaching is difficult,” the disciples say, “who can accept it?” It is a question that rings through the ages to our own hearts and minds and bodies. How are we going to respond to Jesus’ difficult teaching? What do we do when we’re confronted with teaching we don’t want to hear? In the next 10 verses, a range of responses are described. There is complaining, of course, and it’s implied that offence is even taken. There is disbelief and betrayal. Several disciples respond by rejecting it outright, turning back to no longer go about with Jesus. And finally, Peter expresses the fullness of faith, saying: “Lord, to whom can we go? You have the words of eternal life. 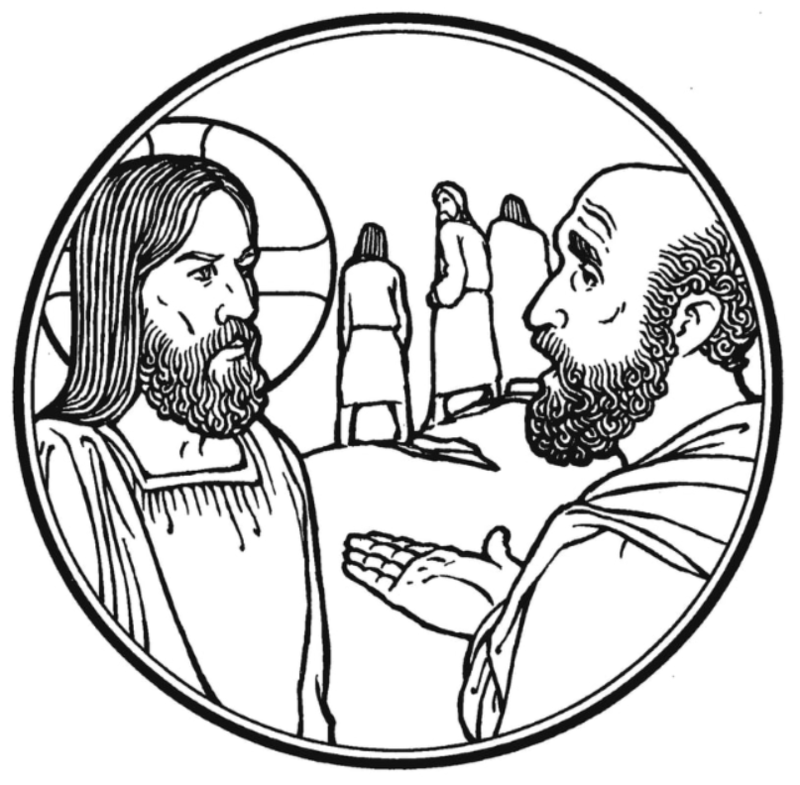 We have come to believe and know that you are the Holy One of God.” Our Gospel today narrates a full range of response to Jesus and Jesus’ teaching: complaining, disbelief, rejection, betrayal and faith. How do we respond to Jesus’ difficult teaching? How will we respond to Jesus today? Rejection is a close cousin to betrayal and almost as painful. In our passage today, we hear that: “… many of his disciples turned back and no longer went about with him.” The implication is that the rejection comes from those who were never all that committed… the fly-by-nighters… those following the latest trend, perhaps, but not in it for the long haul. Betrayal is different order of magnitude because it comes from Jesus’ inner circle, his closest friends and followers. Rejection occurs much earlier. One of the ways I hear a sense of rejection expressed is in a phrase like: “the young people don’t come to church anymore.” We raised our children in the church; we faithfully taught them Sunday School; we did the best we knew; and then they grew up and rejected the faith and the community we hold dear. Too often, our unacknowledged grief at the rejection of our own kin hold us back from being able to see and love the young people who are part of the church. More like in the early church than in any generation in the past many centuries, the boundaries of Christian community are now distinct from the boundaries of our natural family or our social group. This is a very significant transition. Today more than in decades past, healthy Christian community, healthy parishes, transcend social, ethnic or family groups to be defined instead by common Christian mission and purpose. Of course coming to common mission and purpose, common practice and belief as part of our Christian journey, is also in flux today. Teaching at Sorrento this summer, I was reminded about the questioning that initiated the new stream of Christianity known as the “emerging church.” Theologian Tony Jones described how faithful young people 20-odd years ago began wondering broadly about 2 things: re-thinking how we do church… and re-thinking the Gospel itself. The 2 are connected, to be sure, but for the purpose of understanding, it’s helpful to pull them apart to distinguish the intellectual work around what it is we actually believe; and the concrete work around how we live out what we believe in the church and in our lives. Those who swim in this new stream of Christianity have been accused of betraying or rejecting the traditions they were supposed to continue, and yet they themselves would say the opposite. They would say that the Christian traditions they received had departed too much from Jesus’ difficult teaching… that the beliefs and practices had slowly shifted over time such that they now represent a rejection of Jesus’ difficult teaching. They would say that their innovations are not betraying but reclaiming a Christian faith that wrestles with the difficulty of Jesus’ teaching for our time and place. The 21st century reformers confess the fullness of faith expressed by Peter in our Gospel today: “Lord, to whom can we go? You have the words of eternal life. We have come to believe and know that you are the Holy One of God.” When, with Peter, we choose this response… when we choose to throw our lot in with Jesus… when we choose to wrestle with Jesus’ difficult teaching… we need to remember that not everyone will make the same choice. And more, with Jesus and with Peter, we will also be faced with complaining, disbelief, rejection and betrayal. We can take heart in the company of those who also choose the difficult and life-giving way of Christ. We can take heart that the Holy One of God shows us a way of life overflowing with peace and joy and love. That way will go through suffering and death, betrayal and rejection, complaining and doubt, but through it all, Jesus’ way is characterized by an abundance of life, here and now, that is eternal life. When we choose a faith that isn’t deterred by Jesus’ difficult teaching, we journey into the heart of God.